It’s all anyone can really talk about the last few days and there doesn’t seem to be much of a dialogue yet about how businesses can benefit from the phenomenon, so I thought I’d toss out a few ideas and get the ball rolling. Title of this post inspired by a photo in a Forbes article by Jason Evangelho that’s worth a read. If you have no idea what Pokémon Go is, then… well, I don’t know what to say. It’d have been pretty hard to miss this over the last few days unless you’re intentionally avoiding social media. You better have a good reason. The basic gist is that Nintendo has just released their second-ever mobile app, this one based on the Pokémon franchise, and it’s gone absolutely viral crazy. My understanding of the general gameplay is that you go out into the world to find and capture wild Pokémon (Augmented Reality using your phone’s camera), and then you can use those Pokemon to capture and hold key locations. For those that know of Ingress, this will sound familiar because it’s made by the same people and follows similar gameplay mechanics. Because, as mentioned, it’s gone absolutely viral crazy. Within a few hours of its release, I had a ton of friends posting photos of Pokémon they’d found, and within 24 hours my feed was filling up with Pokémon Go memes. This past weekend in Perth (Australia) we had about 3,000 people show up at a Pokémon Go Walk. I’ve heard of other walking events, pub crawls, and other meet-ups happening around Australia and the world as people get together to capture Pokémon. News is being made as people have found dead bodies while looking for rare Pokémon and sooner or later there’s going to be a huge story when someone gets hit by a car while chasing after a Pikachu. This is big, it’s time to pay attention. I’ve never played a Pokémon game in my life, and I’m willing to bet that a lot of the people that are downloading and playing this game haven’t either. It’s one of the first geo-AR games that has captured this much attention, and everyone’s checking it out. And one thing I think is really cool about this is how quickly the game has ‘aged up’ — this isn’t like Snapchat or Instagram where all the high school kids get on it first, and then it slowly ages up to the point where professionals and grandmothers are on it. This is something that directly appeals to my age group (25–35), who grew up with the Pokemon cartoons and games, and so adult adoption has been super fast. Isn’t it funny how often opportunity and skepticism go hand-in-hand? That Forbes article I linked at the start of this post gives a great example of the different reactions we’re likely to see to this phenomenon. 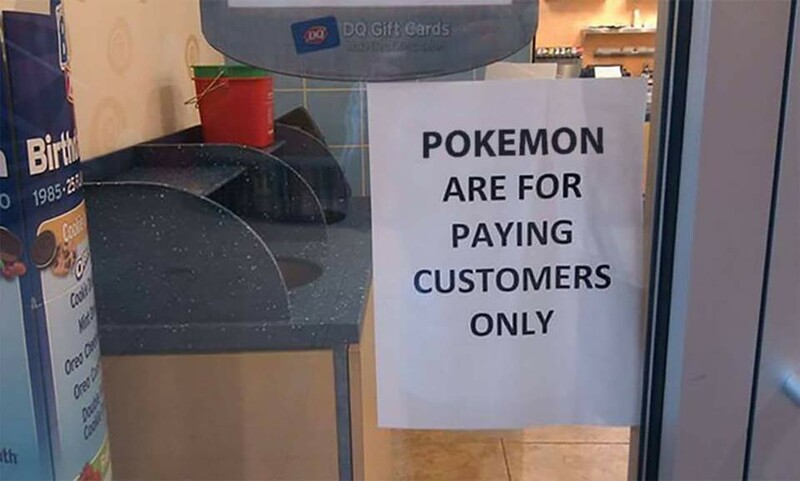 Some businesses are going to try and capture the market, while others are going to get annoyed by all the Pokémon Go players that keep coming into their business. There definitely seems to be some skepticism from business owners — from the Dairy Queen that put a “Pokémon are for customers only” sign up, to the bar owner that just told me he didn’t think that people would be willing to engage with the business that they’re playing the game in, and that they might even take up a valuable spot that a paying customer would otherwise occupy. 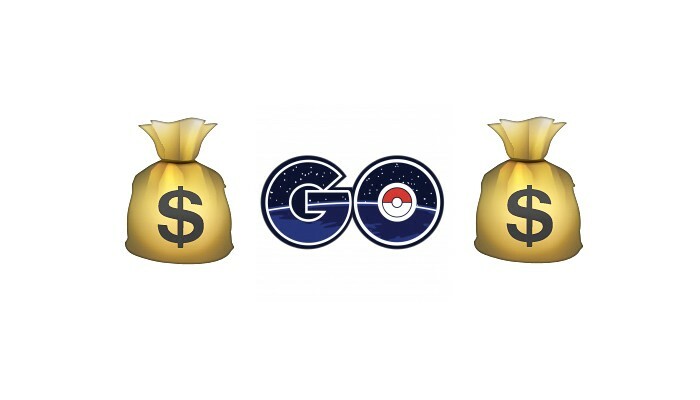 I’d be keen to hear from anyone who thinks Pokémon Go has been harming their business… particularly I want you to explain what you’ve done to try and capitalize on the phenomenon and why this hasn’t worked. I just can’t imagine there’s a world where having a whole bunch of potential customers coming to your door is a bad thing. Even if your conversion ratio drops a bit on that day, the sheer increase in volume of foot traffic should make it more than worthwhile. (10 visitors with 5 customers is not as good as 100 visitors with 20 customers). These are some of the opportunities I see. Would love to see this turn into a brainstorming session as others post their ideas. Credit to /u/applesnider for pointing this out in this post over in /r/marketing on Reddit. Basically, Pokemon appear in the real world near “Pokéstops”. You can increase the likelihood of Pokémon appearing at a particular Pokéstop by purchasing a lure using in-game currency. The real-world cost to this apparently works out to under $3 per half hour. If your business is located at a Pokéstop, buying a lure will naturally bring more players to your place of business. Take it one step further and promote on your social accounts that “For the next 5 hours we’ve got a Pokémon Lure at our store! Come in and catch them all!” Create an event, have a special Pokémon discount and/or menu item. Put up a chalk board with a snappy quote that people will photograph and share (people are sharing the hell out of anything Pokemon-related right now). As a side note, Pokéstops seem to appear at particular Google Maps locations. Does anyone know what drives this logic? How would you go about creating a new one? Doing a quick Google, this post seems to indicate they are chosen from Ingress portal locations and that you can’t add new ones. This one is fairly basic, but it’s useful for people (like myself) who don’t have a brick and mortar location. Basically you want to find some way to create content based on Pokémon Go. So here’s an example — Squishy Forts are my pillow fort construction kits. When you first download the app, you immediately find a Bulbosaur right in front of wherever you are (in the direction you’re facing). So, I’m going to build a pillow fort using my product, create a new account, take a photo and share that on social media with the tagline “Ever found a Pokémon in your Pillow Fort?” Because it’s trending right now, it’s likely to get more likes, maybe a few shares… it’s just a nice piece of content that’s easy to produce. Similarly, from where I’m sitting now I can see that there are two Pokéstops at the dog park where I take @Yahtzeedog. Tomorrow, when I take him on his walk, I’m going to sit him down next to whatever Pokémon I find and snap a photo. Maybe I could make a joke about “throwing the Pokéball.” Again hoping for likes and shares, it’s just a nice piece of content marketing that’s relatively low-effort to produce. Heck, maybe you could even write an article with your thoughts on the phenomenon and suggestions on how businesses can benefit from it, as a bit of soft personal brand promotion. You have to walk a bit of a careful line here in using Nintendo’s IP, but there’s all sorts of opportunities for websites or businesses based around the Pokémon IP. Maybe you capitalize on the Pokémon trend by setting up an Amazon affiliate site based around Pokémon clothing and accessories. Maybe you sell Pokémon-themed phone cases. Maybe you make, sell and ship “trainer survivor packs” which include tiger balm to ease those sore legs that are becoming pandemic in Pokémon fans, as well as water and sun protection. Maybe you could create a Pokémon Go fan page on Facebook and just post all the memes or photos of Pokémon in weird places. I’m sure there are other opportunities, keen to hear what others are thinking.